Sorry, but no official profile of Beelzebumon + Revolmon has been added yet. Anime/Manga Digimon Xros Wars: "Shoutmon, Proof of a King!" 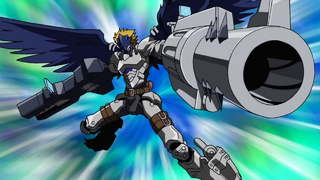 Death the Cannon Spiral  デス・ザ・キャノン・スパイラル Desu za Kyanon Supairaru Twin Cannons Fires energy bullets from both its guns that spiral towards the enemy and converge on impact. Beelzebumon suggests to Taiki that rather than joining Shoutmon X4 to become Shoutmon X4B, it would be better to attack Blastmon's clone from two sides. ↑ 1.0 1.1 Digimon Xros Wars: "Shoutmon, The Proof of a King!" This page was last modified on 26 October 2018, at 17:31.